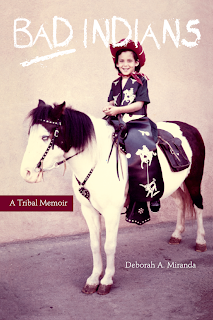 The California Genealogical Society is pleased to welcome author Deborah A. Miranda who will read from her new book, Bad Indians: a Tribal Memoir. The book integrates California Mission Indian tribal history, family and oral histories and also features a genealogy based on her mother's work that traces her Ohlone/Costanoan-Essalen ancestors A powerful account of loss and survival, Miranda reassembles the shards of her people's past in this groundbreaking book. Deborah A. Miranda is an enrolled member of the Ohlone Costanoan Esselen Nation of California, and is also of Chumash and Jewish ancestry. The author of two poetry collections – Indian Cartography, which won the Diane Decorah Award for First Book from the Native Writer's Circle of the Americas, and The Zen of La Llorona, nominated for the Lambda Literary Award – she also has a collection of essays, The Hidden Stories of Isabel Meadows and Other California Indian Lacunae, forthcoming from the University of Nebraska Press. Miranda is an associate professor of English at Washington and Lee University and says reading lists for her students include as many books by 'bad Indians' as possible.